Hot air balloons are aircraft that gain their lift by heating a large contained envelope of air above the ambient temperature. The envelope containing the warmer, less dense air rises and is used to lift the payload of basket, fuel tanks and passengers. The air in a typical balloon may be heated approximately 90 to 100 degrees C above ambient temperature. The balloon will then float at whatever altitude the mass of cold air it displaces equals the combined mass of the warmer contained air, balloon system and payload. A balloon has no means of propulsion. Except when ascending or descending it is stationary in the air and its ground speed is exactly equal to wind speed. Airspeed is zero and there is no aerodynamic lift. This results in the smoothest ride possible in any form of aircraft. There is absolutely no vibration and no matter what the speed is over the ground, there is no wind noise in the basket. Level changes are achieved by more heating to climb. Descent may be initiated by dumping hot air from a valve in the top of the envelope or simply letting the air cool down. It is only whilst climbing or descending that passengers may experience a little air speed in the basket as the balloon passes through temperature inversions or wind shears. A hot air balloon comprises of several components. The envelope itself is a VH (Australian) registered aircraft. It may vary in volume from 600 cubic metres (one person) to 13,000 cubic metres (20 persons). The envelope is attached to the basket via stainless steel or kevlar flying wires. The baskets are still woven wicker as this provides enormous strength and passenger protection, but is flexible so does not break on the occasional bumpy landing. Stainless steel propane fuel cylinders are carried in the basket to provide fuel for the burners which are suspended between the basket and envelope. In winter, the fuel cylinders may have nitrogen added to maintain burner pressure. Instrumentation consists of altimeter, variometer (measures vertical speed), and envelope temperature indicator. Most balloons operating in Australia are VHF radio equipped and also carry a transponder in accordance with standard airspace requirements. As previously discussed balloons have zero airspeed therefore they cannot turn to avoid obstacles or other aircraft. They can, however manoeuver vertically provided there is sufficient time and advance knowledge of an obstacle. 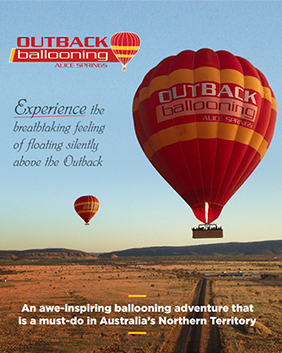 Most balloons operating in Australia have maximum legal climb rates of 5 metres per second. Descent rates may be similar but pilots will typically climb and descend at a maximum of 2 metres per second. Whilst these quite fast rates can easily be maintained, there is a little time lag between initiating a climb and it actually happening. A reasonably large balloon will contain 10 tonnes of hot air. This added to a payload of over a tonne gives a significant aircraft mass and despite the enormous energy output of the propane burners, it may take up to 30 seconds to get this mass moving rapidly in a different vertical direction. The simple answer is that a person should not be surprised to see a balloon almost anywhere although geographic and regulatory factors result in the favouring of certain locations. The regulations provide for commercial licences and private certificates. There are certain restrictions on where private balloonists may operate such as around airports. Firstly, over or around the capital cities, particularly Canberra, Gold Coast, Melbourne and the Western suburbs of Sydney. Separation will be provided by Air Traffic Control if the balloons are operating in controlled airspace over the cities but particular attention should be paid by pilots operating outside controlled airspace. Secondly, around smaller inland country towns within a few hundred kilometres of the capital cities. Towns with a reasonable surrounding road network will be favoured as this makes it easier for retrieve vehicles to collect the balloon and pilot from its inevitable outlanding. Coastal towns are less appealing because flying is restricted in the case of an offshore breeze. Coastal terrain is also generally less balloon friendly, with more hills and forests than inland areas. Balloons will regularly operate up to 5000 feet but they should be expected up to 10,000 feet. They will rarely fly above this level because of the inconvenience of arranging oxygen and special approvals. In fact, balloonists delight in low level flight and may spend entire flights brushing through the tops of trees. Balloons are not allowed to fly in cloud but they may fly in fog. It is impossible to fly a balloon any way other than the right way up so complex instruments are not required even if visibility is very low. Balloons may also operate at night VMC provided so they carry a red light suspended below the basket. This however, is an insignificant beacon compared to seeing the entire 30 metre tall balloon light up like a globe when the burners are activated. Why Balloons Fly So Early in the Morning? Perfect time for launch! Right on sunrise. Whilst balloonists rely on hot air for lift, they hate thermals or convective conditions. When a balloon is flying in stable air the pilot determines the height by use of the burner. However, if caught in thermals the balloon will ascend whether the pilot wants it to or not. Even worse, is the unplanned descent after being ejected from the top of a thermal! This is not a comforting experience and may not be solved simply by flying out of the thermal as remember, the balloon moves only with the air. The surface wind speed is the landing speed and balloons always make ‘wheels up’ landings. Balloonists thus prefer the early mornings before the wind speed increases. For these reasons, balloon pilots avoid the windy thermic parts of the day and should therefore be expected mostly in the mornings or evenings. The best way to appreciate how a balloon operates is obviously to take a ride in one. Almost every aeroplane pilot is amazed at the complexity and subtlety of air currents they discover in a balloon. It seems that many power pilots are nervous (or perhaps simply uncertain) about the concept of flying in a balloon but it is the smoothest gentlest form of flight possible.